I was walking along the water front in New Jersey last year just fellowshipping with the Lord and He spoke something that caused me to look deeper at the life I live. Yes I was I thought, living a life pleasing before Him but this made me understand even more so how important the life I live is. He said “you must guard your anointing with your life”. As I pondered His statement, He broke it down for me. The life you live has a direct impact on your anointing. God has anointed us in many different ways, however, so many will never walk in the fullness of their anointing because of the life they live. Your anointing is not to be taken for granted. You may be a gifted musician or psalmist or orator or writer, but without the Anointing of God on your gift or talent, you are just making noise. The noise may even sound good but it will lack the power to change and transform lives. That power is found only in God’s Anointing on your life. To guard your anointing with your life, you have to live Romans 12:1. You must become a living sacrifice holy and acceptable to God. This means you must yield your thoughts, your desires, your spirit and your body to God. It is no longer about thinking I am grown so I can do whatever I want to. You transcend from being just a spectator to a participator in the greatest love story ever told. A one-sided love affair is very painful for the one giving all the love and receiving nothing. That is how it has been for God for most of your life. He continually gave His love to you but received no love back. How many times have you heard or maybe even spoken yourself about your relationship with someone these words “I love you, but I am not in love with you.” God desires much more from you than superficial words of I love you. He has been gracious to us by providing people in our lives to show us natural love, but He must always be and remain our first love. The one to whom we give our whole being to. He desires for us to fall in love with Him. 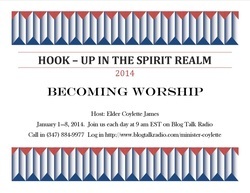 As stated, our focus this week is to not just do worship but to become worship unto God. This can only happen as we fall deeper and deeper in love with Him. Let’s look at the difference between being and doing. There is a distinct difference in being something and doing something. In becoming worship you are identified with the one in whom you are giving worship to. You take on His characteristics and qualities therefore the very life you live becomes a living memorial to Him. This is not for you to desire to be worshiped; rather, as you live your life as a testament to His Glory, you cause others to seek Him and to learn of Him which will cause them to give Him worship. To say you are a worshiper is good; you are performing an action that is right before God. He is to be worshiped. But don’t stop with just the raising of your hands and the singing of your songs, but continue on to the giving of your heart and the surrendering of your will to Him. Let your life speak louder than your words. Today ask God to show you what areas of your life that has not become worship. This is our time of giving ourselves to Him to set the tone for the year, so you want to make sure you are holding nothing back. Remember we are now a participator in this love affair, God held nothing back from us, we likewise don’t want to hold anything back from Him. Most of your request for prayer this year was asked to be kept private so in our daily prayer time together we will simply call out your name and come in agreement with God’s will in your situation. Please know however in my private time of prayer I am attending to your specific needs. I encourage you to also continue decreeing the declarations we made yesterday of your life. They are important. If you have not yet read yesterday’s prayer calendar, please do so, the declarations are on it. May God manifest Himself to you in a powerful way on this day 2 of our time together. Heavenly Father we come boldly before Your Throne of Grace and Mercy today. We give thanks and praise to You for You are worthy of all Glory and Honor. Father we pray that today You will accept us as an offering unto You. Father we desire to become worship unto You, not just with the uttering of our words, but through the living of our lives. You have been beyond our comprehension of faithful to us. You have placed Your Spirit within us to ensure we are never alone. You are with us through every valley experience to strengthen us and in every mountain top experience to rejoice with us. Our desire today is to transcend the natural limitations of life on earth and become familiar with the limitless attributes of Your Kingdom. Father You have instructed us to first seek Your Kingdom and Your Righteousness and when we seek You first, You have promised to supply all of our needs. So we rise up early to seek Your Face and Your Heart that we may have clear understanding in the way You would have us to go. Your Kingdom holds no lack, there is no sickness there, there is understanding of the knowledge and wisdom found there and as Kingdom Citizens we have rights to all that Your kingdom holds. We acknowledge Father that our ways and not your ways, we therefore ask the Holy Spirit to pray through us that our desires will be aligned with Yours. We ask that the same mind that was in Christ Jesus be also in us that we may yield our thoughts to You. We take captive every thought that would exalt its self over Your will and command our thoughts to be good, pure, righteous and of a good report. You have already declared that we are the temple of the Holy Ghost if we have yielded our bodies to You as a living sacrifice and that no unclean thing shall dwell in Your temple. Therefore with certainty we command every foul manner of disease to depart from Your vessels. Cancer most bow to You and depart, depression must bow to You and depart, hypertension must bow to You and depart, diabetes must bow to You and depart, fibromyalgia, Chronic fatigue, muscular dystrophy, and any other diseases must bow to You and depart from Your temple. We decree wholeness in relationships, first and far most in our relationship with You, then with those around us including our families, co-workers and co-labors in the Gospel. We arrest the spirits of dissension, deception, division, divorce, malice, misunderstanding, and confusion and forbid them to operate in our lives. We ask Lord that you would increase our discernment so we can see these unclean spirits for who they are and not allow ourselves to entertain them. Instead, we stand in the power of Your might to defeat them. We speak life and not death to our marriages. We vow to build our spouses up and not tear them down with our mouth. We declare over our seed as part of our household, they shall be saved. We thank You for the ability to live peaceably with our neighbors. Now Father, as we call out the names of our brothers and sisters in Christ, we know you know every need they have. We place them and their needs on Your alter and we come in agreement with Your Word concerning them. Thank you for making the crooked road straight and making a way in the midst of no way on their behalf. Thank you for your counsel to them in all their decisions. Thank you for the healing of the mind, bodies and soul. We decree this to be the year of great manifestation of Your Glory in their lives. We thank you that their election and call upon their lives will be made sure this year. We thank you Lord for: Gracie Spaight & family, Sam Okon, Apostle Michael Thomas & Family, Apostle Paul & Lady Keisha Greenleaf, The Russell Family, Travon Muse, Pastor Linda Reed, Pam Waring & family, Debbie McKenzie & the McKenzie-Warren household, Johnny & Brenda Doubose, Apostle Denise Bundick-Keller, Pastors Deontia & Seneca Atkinson, Joyce Roberson, Pastor Vincent Dent & family, Deborah Sweet & family, Khima Bibbins, Marilyn Magallanes, Adrienna Turner, Coy Sparks & family, Simone Sparks & family, Bianca Withers, Carlton James, Bishop Carl Alexander, Connie Davis & family, Helen Akins, Bea Dyess & family, Grace Carty & Family, Harris & Gale Haith, Dana Pitcher, Khima Bibbins & Family, Debra Sweet, Pastor Nat Komba and all who have joined in this time of Prayer and Fasting. Thank You Father in advance for Your Grace, Mercy, Protection and Favor over our lives for this year, in the Name of Your Son Yeshua HaMashiach, Jesus the Christ, we declare IT IS SO! Amen!